And the Winner is … Trivia Bee Creates a Big Buzz in Town! 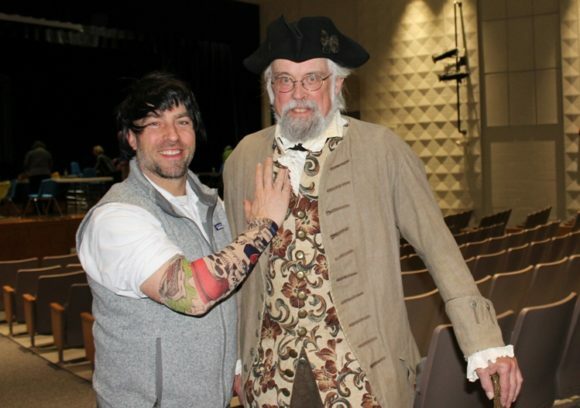 You are here: Home / Towns / Lyme / And the Winner is … Trivia Bee Creates a Big Buzz in Town! 2018 Trivia Bee champions RTC Elephants, (from left to right, Atty. 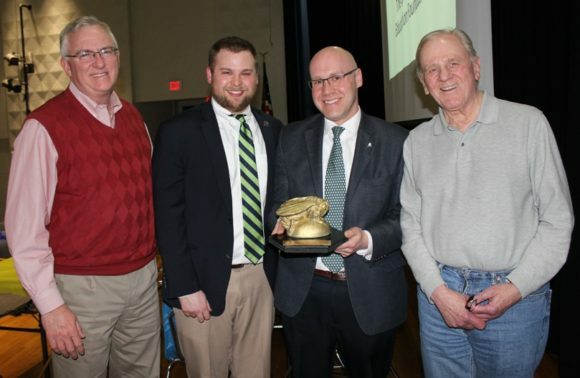 Mike Miller, LOLHS Class of 2013 alumnus Sam Stadnick, State Rep. Devin Carney (R-23rd) and Cliff Johnson) proudly pose with their coveted Bee Trophy. UPDATED 11:34am: It was a hotly-contested event with brainpower being tested to the extreme. 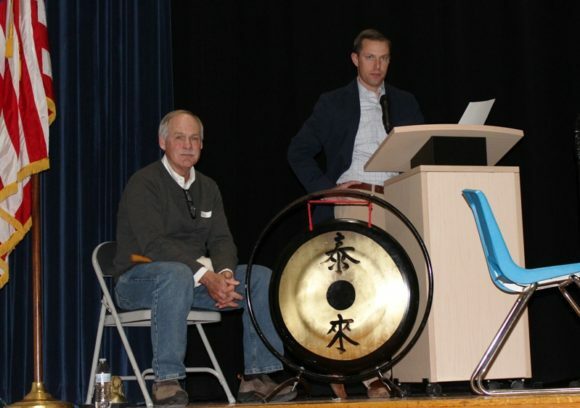 The 2018 Trivia Bee organized by the Lyme-Old Lyme Education Foundation (LOLEF) was held Friday evening in the Lyme-Old Lyme Middle School auditorium and saw more than a dozen teams doing battle over challenging questions posed by WFSB News Anchor Eric Parker. The 3-PEAT team played hard to the bitter end taking the RTC Elephants to three rounds of play-off questions in the ‘Sting Off’ before finally succumbing to the runner-up position. There were three ‘swarms,’ which involved all the competing teams in a 10-question play-off situation to identify the three finalists, who ultimately were the All-Pro, 3-Peat and RTC Elephant teams. Concentration was intense among this team’s members whilst working on their answers. With tension rising in the final round, All-Pro fell out of contention fairly rapidly but 3-Peat and the RTC Elephants kept going neck-and-neck question after question. 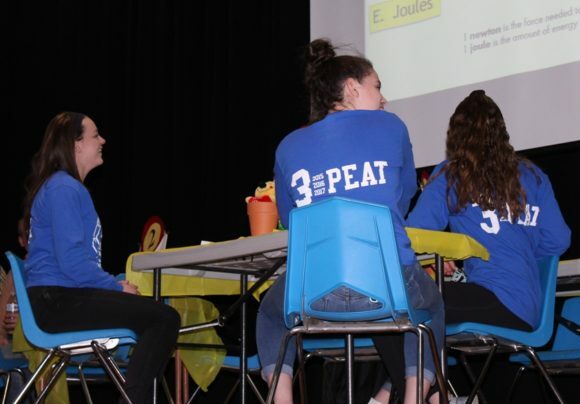 When finally the last available question was posed, the RTC Elephants secured the win with the correct answer while 3-Peat had to settle for second place after a valiant effort. Question master and Channel 3 news anchor Eric Parker (standing) and timekeeper Rob Roach kept things under control at all stages. 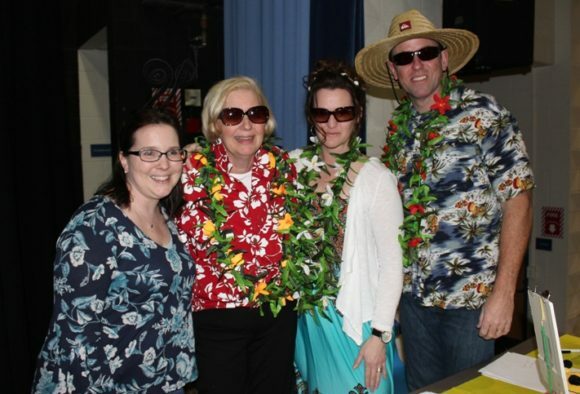 All funds raised at the event benefit programs and equipment selected by LOLEF for Lyme-Old Lyme Schools. 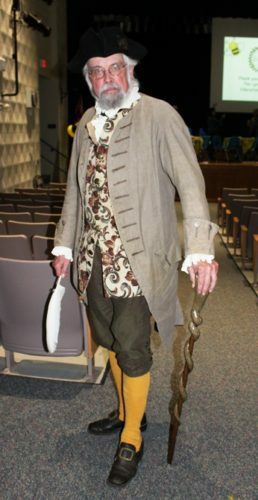 The Old Lyme Historical Society’s (OLHS) team, some members of which are pictured below, came dressed in wonderful costumes (but surprisingly did not win the Best Costume award) and also put up a valiant fight in the quiz section to no avail. 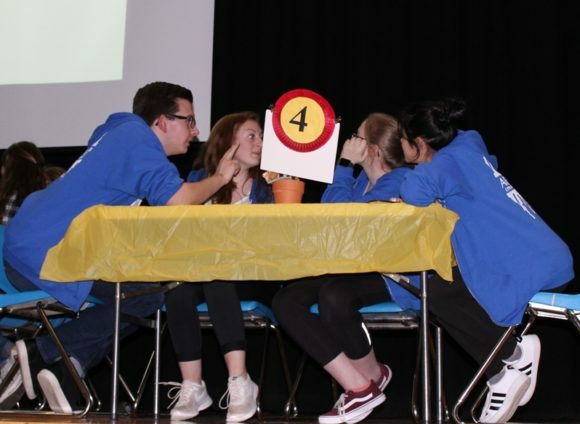 So to the OLHS team, better luck next year … and to all the competitors, sponsors and the LOLEF, thanks for making an otherwise cold and dull Friday evening into a fun-filled night at which everyone learned something and funds were raised for a worthy cause.